What to Do before Selling Old iPhone or Give It Away? The new iPhone 8/iPhone 7S/iPhone 7S Plus is coming out soon and you have thought to yourself, “I don’t need two iPhones”. Exactly, and you decide you’ll get rid of the old iPhone once the new model comes out; to recover part of the fees you will pay. This is a fantastic idea just that you fear for your private data and all your information stored on the old iPhone falling in the wrong hands. So what to do before selling iPhone? Reset iPhone to sell? But you’ve heard that iPhone reset doesn’t really wipe the phone permanently. That data can still be recovered. Good news, there’s a way to erase your iPhone data permanently - permanently means that the erased data will be 100% unrecoveravle, even data recovery tools cannot recover such data. And I’ll be sharing with you in this article. What To Do Before Selling Old iPhone? Step 1. Plug your device to your PC via the USB cable and launch iTunes. Step 2. Sync your device to your iTunes. Step 3. Right click on your device name on the left hand panel, then Right click and select “Back Up” from the menu. 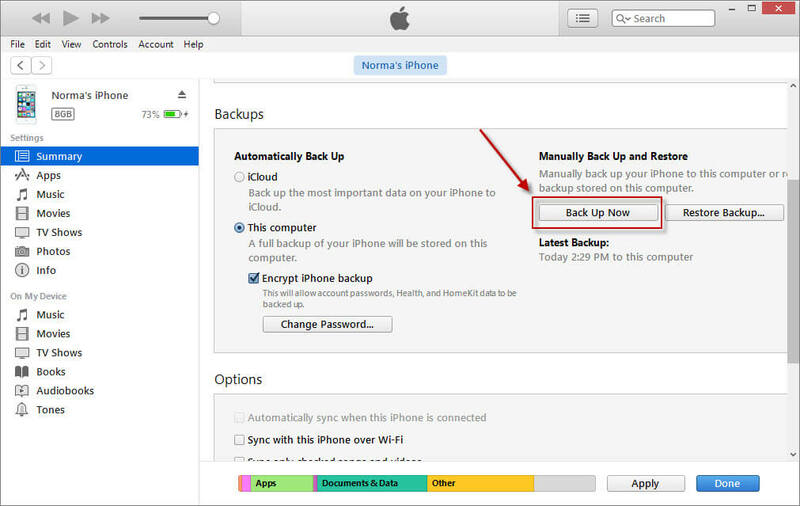 For iOS 7 and below, after selecting “iCloud”, select “Backup and Storage”. Important files you might need to use on a later date. You can drool over memories whenever you want to. You can still use your device if the sales doesn’t materialize. Your contacts are perhaps more valuable that other information you have on your iPhone, as it contains the details of your network. If you don’t want to lose important contacts of your network, what to do before selling iPhone is to export your contacts to iCloud. Step 1. Log into your iCloud account and click on the contact app. Step 2. 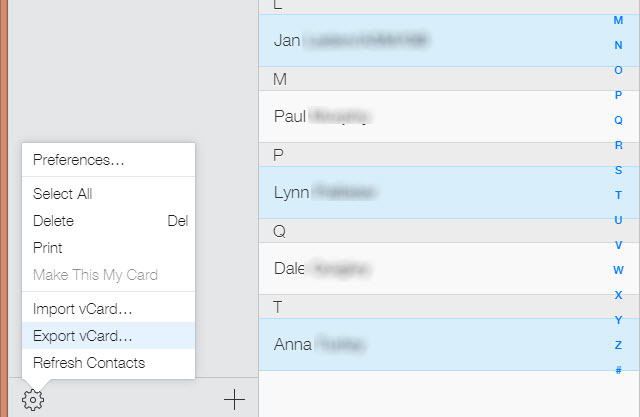 When your contact list is displayed, click on the gear button on the bottom left, click “select all”. Step 3. Click the gear button and select “Export vCard”. Step 4. Select save on the dialogue box to save the contacts on your PC. So, how to erase iPhone before selling? iMyFone iPhone Eraser or iMyFone iPhone Eraser for Mac is the powerful tool. It is used to manage all kinds of data on iPhones and other iOS devices. It power stems from the ability to delete and erase files permanently with no chance of being recovered by any recovery tool. Thus, much more safe than a iPhone “Factory Reset”. 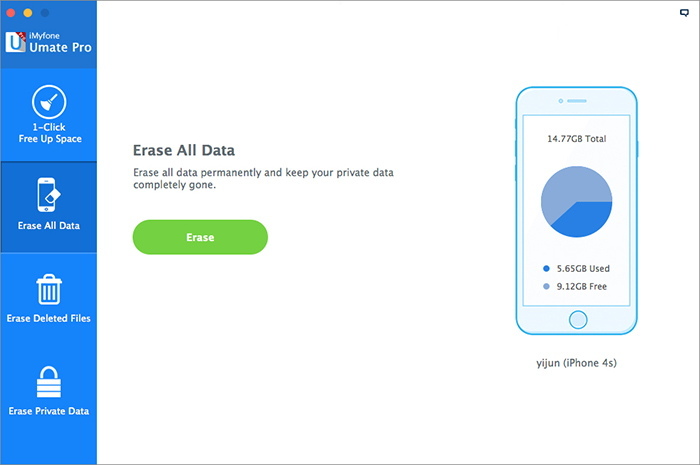 Erase Private Data You can selectively erase some private data here without any chance of recovery, such as notes, messages, contact, call history, voice memo, Safari history, third-party App data, and more. Erase Deleted Files:It will 100% erase previously deleted data without any means of it been recovered, as deleted files on iDevices can be easily recovered by third party applications. Erase All Data: In this option, files deleted cannot be recovered via any tool. Even though iPhone reset will remove the files from the surface, it can still be recovered through powerful recovery tools. Fully compatible with iOS 11 and receive lots of positive reviews from macworld.co.uk, getintopc.com, pocket-lint.com, macbed.com etc. To erase iPhone before selling it with the help of iMyFone Umate Pro, you just need to: Run the program > Connect your iPhone > Choose the mode of “Erase All Data” > Click “Erase” and begin to erase your iPhone. If you no longer have your iOS device, how to erase it? Politely request the new owner to delete all data and settings as illustrated above. Erase your device from Find My iPhone app on iCloud from icloud.com/find by selecting your device and clicking “Erase”. After this, simply click “Remove from Account”. If this is also impossible, change the password of your Apple ID. This basically locks out any access to your files via the old phone. If perhaps you’re switching to other operating system different from iOS, deregister iMessage. To protect your finances, remove your credit and debit cards from Apple Pay via iCloud.com. Remove all payment options from the Apple Pay settings.